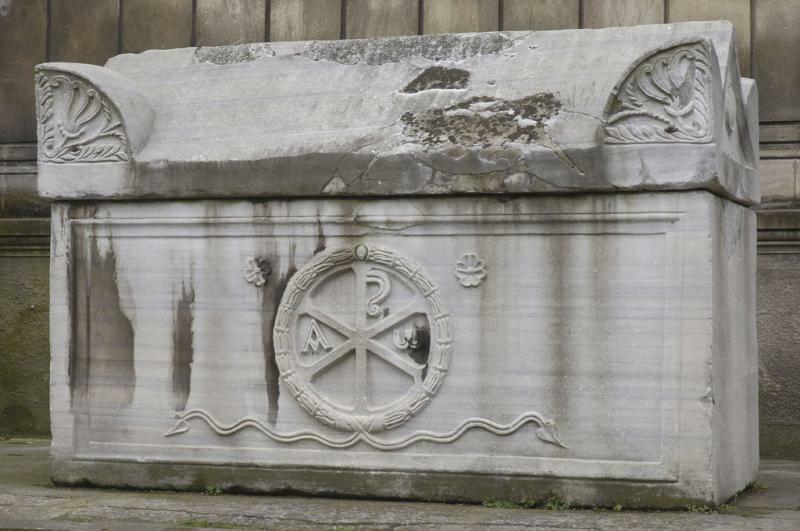 An obviously Christian sarcophagus (because of the medallion with the The Chi Rho (/ˈkaɪ ˈroʊ/; also known as chrismon) which is one of the earliest forms of christogram, and is used by some Christians. It is formed by superimposing the first two (capital) letters chi and rho (ΧΡ) of the Greek word ΧΡΙΣΤΟΣ "Christ" in such a way that the vertical stroke of the rho intersects the center of the chi. The Chi-Rho thus symbolises specifically the status of Jesus as the risen Christ (Messiah). The Chi-Rho symbol was used by the Roman emperor Constantine I (r. 306–337) as part of a military standard (vexillum). Constantine's standard was known as the Labarum. In this particular case we also see the Alpha and Omega: The term Alpha and Omega comes from the phrase "I am the alpha and the omega" (Koiné Greek: "ἐγὼ τὸ Α καὶ τὸ Ω"), an appellation of Jesus in the Book of Revelation (verses 1:8, 21:6, and 22:13). The first part of this phrase ("I am the Alpha and Omega") is first found in Chapter 1 verse 8 ("1v8"), and is found in every manuscript of Revelation that has 1v8. Several later manuscripts repeat "I am the Alpha and Omega" in 1v11 too, but do not receive support here from most of the oldest manuscripts, including the Alexandrine, Sinaitic, and Codex Ephraemi Rescriptus. It is, therefore, omitted in some modern translations. Scholar Robert Young stated, with regard to "I am the Alpha and Omega" in 1v11, the "oldest [manuscripts] omit" it. Well, regarding the "Probably the sarcophagus of Constantine the Great" of the Guest: In "Byzantium" by John Julius Norwich (part 1 in my edition) it is described what happened to his body. First burial in a self-designed Church of the Holy Apostles in a central tomb amidst twelve sarcophagi containing relics of the apostles. Then doubt if the roof would hold, a plan to transfer the sarcophagus, a riot against that sacrilege. And in 550 a complete rebuild by Justinian. And "Of those twelve apostolic sarcophagi and the great tomb of the Emperor among them, not a trace remains". So in my mind this is just another (Christian, see the cross and the letters) sarcophagus. I would also expect it to be in porphyry. Muhtemelen Contanstine the Great Lahiti.